Energy Rentals is all about supplying cost effective event power and temporary power solutions to our clients. Customers who require a specialist company that delivers a excellent and knowledgeable service along with personal tailor made solution. 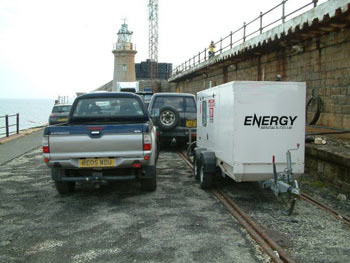 The Energy Rentals team has years of experience in the power industry, working with many companies and clients requiring event and temporary systems across the UK and Channel Islands. Energy Rentals supply a plethora of industries with solutions for corporate events, green field sites, product launches and industrial companies. We supply temporary generators to power hotels, corporate banks, charities and sporting events, as well as large indoor and outdoor temporary mains distros in all sizes to power your event, whatever the size, whatever the occasion. We cater for religious events, all type of functions whether private or corporate, sporting events, award ceremonies, concerts, festivals and all types of large scale outdoor events. We supply temporary systems to banks and customers requiring back up power systems. We also cover emergency situations where temporary power is required at short notice. Whatever the event, whatever the occasion, temporary power or event power, think Energy Rentals Ltd. Energy Rentals has vast stocks of high end power available for hire. We stock all forms of mains from 16amp, 32amp, 63amp and 125 amp in both single and 3 phase, as well as heavy mains with 400 and 600amp 3phase powerlock also in stock. Energy Rentals also stock massive quantities of temporary distros in rubberbox format, again in 16 through to powerlock, in both single and 3 phase formats. Your project is safe in the knowledge that we have the stock to cover your project with ease. Energy Rentals also cover every aspect of outdoor lighting with both lighting towers and festoon lighting available for hire. When it comes to generators we have the solution to suit you requirements with 20kva up to multi megawatt in either single or synchronised sets. Energy Rentals has fast become the number one choice when considering your power needs for events and special projects, both permanent and temporary. Our technical expertise and service are due to our excellent team with a wealth of experience working at the highest level for some of the largest projects and events in the UK. Our team has worked on major pop and rock tours and all of the major UK festivals, as well as specialist projects for major banks and industrial applications. We also supply private functions on a almost daily basis giving them the very best service to make the event or project happen whatever the issues. Energy Rentals only use current equipment and regularly purchase the latest equipment to keep our rental stock full and the best money can buy. You can rest assured only the best will be used for your project. What else makes Energy Rentals different from the rest? We are different because we believe we make a difference! Energy Rentals has an expert team of project managers that can help you plan and manage your event to its successful conclusion, by holding quality stock coupled with years of experience in the industry and helpful knowledgeable project managers, you are safe in our hands! So, when you think event power or temporary power, think of our expert team, think of our massive rentals stock, think of our customer service, think Energy Rentals Ltd – the number one power system supplier. We supply all over the UK and Channel Islands, so whatever your event or occasion contact us today for a free no obligation quotation.